The Trump Administration has promised to make it more difficult for unauthorized foreigners to enter and work in the United States and for undocumented workers to access health care services. 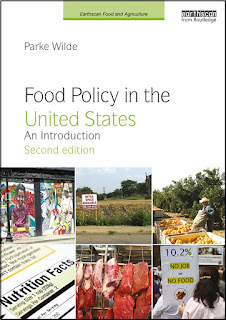 Such policies, if implemented, could have serious negative repercussions on the agricultural sector, which relies heavily on immigrant workers. Replacing foreign workers could be complicated due to difficulties in sourcing and hiring domestic workers to replace displaced undocumented workers. Additionally, the health deterioration of farm workers could negatively impact labor productivity, the sector’s viability, and the nation’s domestic food supply. Cesar L. Escalante and Tianyuan Luo focus on the implications for laborers -- and the farmers who hire them -- of reducing access to health care. Thomas P. Krumel, Jr., has an interesting article about immigrant labor supply in the meatpacking industry, including its implications for meat prices. 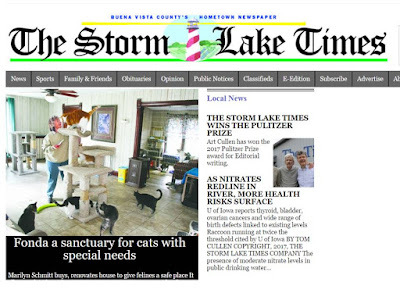 The Storm Lake Times, a tiny newspaper in rural Iowa, became the topic of headlines around the world this week after it won a Pulitzer Prize for its reporting on the local political power of agricultural interests. In this piece by Art Cullen, for example, the paper explored how the Farm Bureau funded the county-level legal defense against accusations that excessive fertilizer use had polluted local water supplies. The Farm Bureau's "generosity" came with a catch. Buena Vista County officially is a Farm Bureau county. The Farm Bureau and Iowa Corn Growers have pledged to cover the legal bills of Buena Vista, Calhoun and Sac counties as they defend themselves against a lawsuit filed by the Des Moines Water Works over pollution of the Raccoon River. The supervisors are expected to happily agree. The BV supervisors looked like the cat that just swallowed the canary upon announcing the deal. They are happy that Farm Bureau is setting the terms of the legal defense and not the elected officials of our county. We have given up our franchise. The supervisors believe they have no choice but to allow Farm Bureau to pay the bills and thus call the shots. They already called one shot: In the Farm Bureau engagement letter proposed to the counties, it states that the counties shall not claim that farmers are liable for pollution claims in the lawsuit in order to hold drainage districts or the county itself harmless. Let us pause for a moment of appreciation for everybody whose work requires them, on occasion, to speak a hard truth.